Students at Newent Community School and Sixth Form Centre are all now learning to be life-savers thanks to a new initiative with the British Heart Foundation. 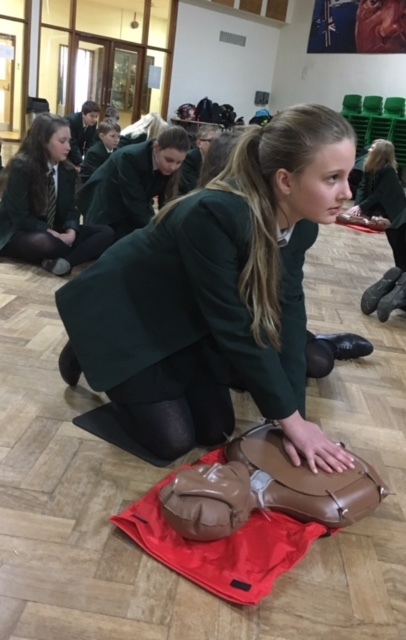 Following a successful bid for equipment and support from the charity, all Year Seven and Eight students are to be trained in doing CPR, ‘the recovery position’ and using defibrillators. On Tuesday (January 16th), 290 11 to 13-year-olds at the Watery Lane school gathered to be taught, and enthusiastically practise on dummies, the vital first aid skills which could enable them to save the life of a member of the community. Principal Alan Johnson said: “We believe we are unique in educating all of our students from ages 11 to 18 in this life-saving skill. In addition to acquiring the academic qualifications to secure their best future, we are determined our students should learn life skills enabling them to truly contribute to their community. This new training means all our students, whatever their age, could now save the life of someone experiencing a cardiac arrest”. Students in Year Nine and above are already trained in CPR during the school’s First Aid Awareness sessions, part of its Personal Social Health in Education programme. All new students entering the school each year will now continue to receive this training. Thanks to a successful bid to the British Heart Foundation, the school has been provided with training equipment worth more than £1,000, enabling 35 pupils at a time to be trained. Josh Ellis, 12, added: “I think it’s a really good idea. If I was anywhere in public and someone had a cardiac arrest, I’d know what to do and be able to do it properly. It could be useful in future life”. Newent Community School is recognised by Ofsted as a ‘good’ school, achieving above average results and with relationships between staff and students described as ‘excellent’. The school is also recognised by the Government as a Healthy School, having achieved the Healthy Living and Learning Award. The school recently became the first in the county to achieve the Gloucestershire Healthy Living and Learning Mental Health Champions Award.